At 25 billion downloads, Apple marked a major App Store milestone. 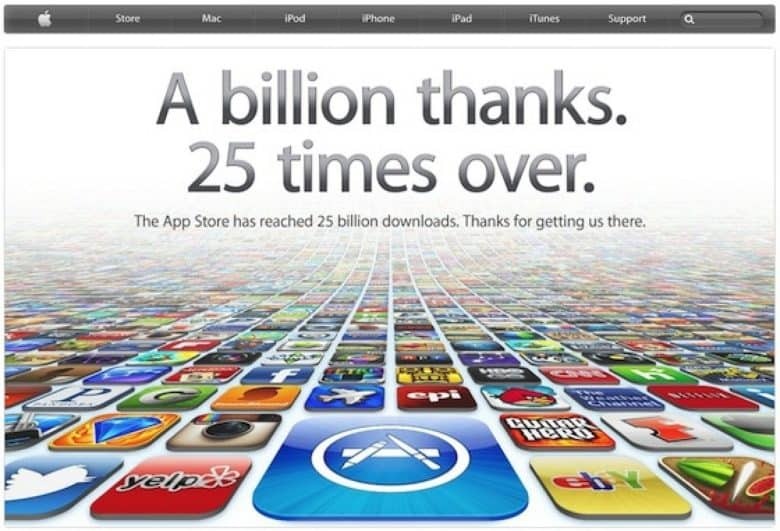 March 5, 2012: Apple reaches a staggering milestone, with 25 billion apps downloaded from the iOS App Store. The company celebrates the occasion with a giveaway titled the “25 Billion App Countdown.” The lucky 25 billionth app downloader wins an iTunes gift card worth $10,000. The winner of the gift card is Chunli Fu from China. The app is Disney’s Where’s My Water?, a free puzzle game released the previous September. At the time, the App Store offered more than 550,000 applications for download. Apple had doled out more than $4 billion to developers for their 70 percent share of revenue from paid downloads. By comparison, today the App Store peddles around 2.2 million apps, with a combined 130 billion downloads. Cupertino, meanwhile, has paid out more than $100 billion to developers. Just a few years ago, Apple liked celebrating milestone events with competitions like the 25 Billion App Countdown promotion. In fact, a 2004 contest to mark 100 million iTunes song downloads made the 2012 app download contest look meager. The winner of the 2004 contest received a personal phone call from Steve Jobs, a 17-inch PowerBook, a 40GB iPod and a gift certificate for 10,000 iTunes songs. Today, Apple mostly avoids making a big deal of these kinds of landmark events. When Apple passed the 1 billionth iPhone milestone, the company did little to commemorate the occasion. The same held true when Apple surpassed the $1 trillion valuation. Apple also avoids sharing too many details about the usage of services like Apple Music, and recently stopped revealing the number of iPhones sold. While we understand the logic behind this less-bombastic strategy, we miss the excitement of such Apple events. It was fun when Apple eagerly (and publicly) counted down to its next gigantic sales record.